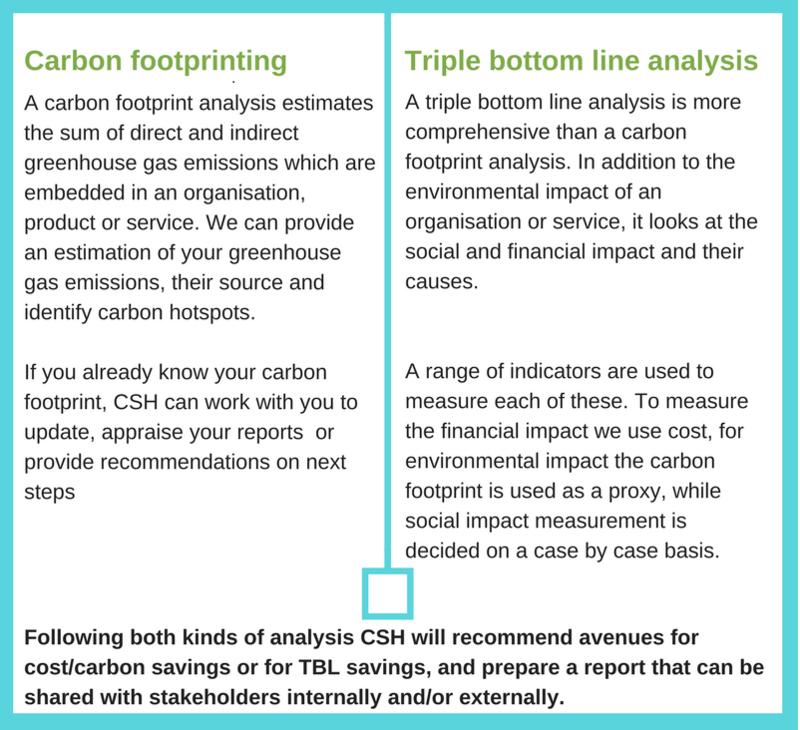 After a carbon footprint or triple bottom line analysis with CSH your organisation will be better prepared to fulfil its goals, to become more efficient and cost effective, to show positive impact and increase its reputation. Why do a Carbon Footprint or Triple Bottom Line Analysis? Help you improve your positive impacts while improving the experience of your staff and clients. This will also improve your organisation’s reputation and make you stand out. Who should do a Carbon Footprint and/ or a Triple Bottom Line Analysis? Everyone! Everything has a carbon footprint and social and financial impact: hospitals, companies, NGOs, health charities, products and services. Organisations that aim to provide a service that benefits people’s health should have their carbon footprint and/or triple bottom line calculated in order to know how their daily activities might be damaging the environment and therefore have a negative impact on people’s health. Hospitals, health organisations and pharmaceutical companies tend to have large carbon footprints because of the scale and resource intensity of their work. However, even if you are just an office-based organisation, your cloud-based storage, travel and procurement could be causing significant emissions and pollution. Carbon footprinting involves collecting data on, for example, energy and water use, waste disposal, procurement and staff travel amongst others. A short overview footprint could consist of simply looking at the break-down of expenditure of the organisation or of the provision of a service and how this translates into emissions. A more comprehensive footprint could include the collection of data on detailed resource use at each step in the process of proving a service or manufacturing a product. TBL requires similar data. In addition, it will collect data on costs and metrics on social impact, for example staff satisfaction, patient/ client satisfaction, supply chain. Dentistry: CSH was commissioned by Public Health England to calculate and analyse the carbon footprint of 17 different key dental procedures carried out by NHS England commissioned dental teams to identify carbon hotspots within the service. Gothenburg University: CSH teamed up with researchers at Gothenburg University to conduct a comparative carbon footprint of conventional diabetes treatment and bariatric surgery based on the long-term prospective matched cohort study of Swedish Obese Subjects. Moorfields Eye Hospital: Moorfields Eye Hospital commissioned a comparative triple bottom line assessment of its central eye hospital and its satellite clinics. We reported on the financial, environmental and social costs of offering paediatric and adult eye motility services at different locations. Becton Dickinson: CSH has recently started a carbon footprint comparison of two of BD’s syringes.